I thought I'd play around again with this month's Color Challenge Colors and Stickerz! You have until this Thursday, May 26th to link up your creation! Just for participating, everyone receives a 25% coupon and one lucky random participant will receive a $20.00 gift certificate to E.A.D. Designs! To enter and find all the details, go to the E.A.D. 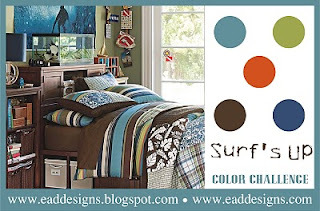 Designs blog here! Products used on my card: FP dp, Neenah cs, and E.A.D. Designs Hang 10 Stickerz. 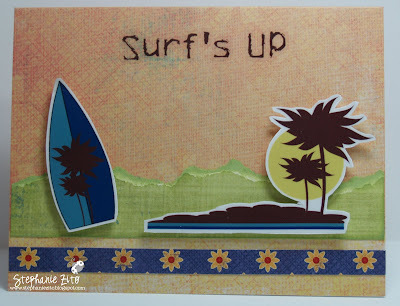 totally lovin your fun surfin card!!!! Makes me want a vacation! 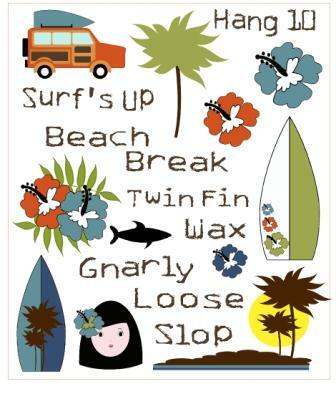 Surf is indeed up! Great little design. Lovely summery card! Warms me up over here in chilly Australia! Great job, what a neat card!